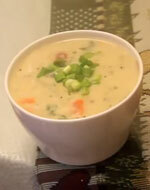 The Bald Chef Has a fine selection of both soups and stew recipes your family will enjoy. You may ask the question what is the difference between Stew and Soup? Well there is no easy answer, other than Stew is a method of cooking meat called stewing. Stewing is the technique of slow cooking many types of meat to produce a very tender cut of meat. Soup one the other hand is a cooking practice that flavors the broth while cooking the meat or vegetable. Stew recipes tend to be more hearty in natures, and soups tend to be lighter meals. The Bald Chef offers some very unique soup and stew recipes from around the world that you may want to try cooking. One of my best recipes is for homemade Beef Stew.